On this date in 1937 the Gestapo arrested outspoken Lutheran theo­logian and pastor Martin Nie­moeller. The next year Nie­moeller was tried for acti­vi­ties against the State. Released after the trial, Nie­moeller was rearrested—presumably because Deputy Fuehrer Rudolf Hess decided to take “merci­less action” against him when the court didn’t. Nie­moeller spent the next eight years in Sach­sen­hausen and Dachau concen­tra­tion camps as a “per­sonal pri­soner” of Adolf Hitler. Initially a sup­porter of the Hitler, Nie­moeller became (like his col­league-in-faith, theo­logian Dietrich Bon­hoeffer) one of the founders of Ger­many’s Con­fessing Church (Beken­nende Kirche), which arose in the 1930s in oppo­si­tion to state-spon­sored efforts to Nazify Ger­man churches and “dejudaize” Jesus and the New Testa­ment. He opposed the Nazis’ Aryan Para­graph, which first appeared in the April 1933 Reich Civil Ser­vice Law but found its way into all sorts of public and eccle­si­as­tical sta­tutes that stig­matized and mar­gin­alized non-German Volk and Ger­mans of Jewish descent. For in­stance, the Aryan Para­graph removed “non-Aryan” clergy from offi­cial church posi­tions and rosters lest their theo­logy under­mine Chris­tian faith and family life. The 1930s “Deutsche Christen” move­ment of clergy and lay people pro­pa­gated anti-Semitic, voelkisch (chau­vinist) ideas in Ger­man schools, on church councils, and in other social arenas. Few cleri­cal or lay leaders departed from the Nazi Party line that a Jewish “prob­lem” existed and that it required restric­tions on the “exces­sive” influ­ence of Jews. In this way the Ger­man church both reflected and con­tri­buted to the poli­tical, social, and racial milieu that made the Holo­caust pos­si­ble. Nie­moeller is best known for penning the poem “First they came for…” (see below), an in­dict­ment of Ger­man intel­lec­tuals like him­self for not doing enough to stop Hitler and the Nazis from liqui­dating their oppo­nents from Ger­man society. (The sub­stance and order of the groups men­tioned in the poem vary from version to version, as Nie­moeller for­mu­lated them differ­ently depending on his audi­ence.) Released from im­pri­son­ment in 1945 by the Allies, Nie­moeller con­tin­ued his career in Ger­many as a clergy­man and as a leading voice of penance and recon­ci­li­ation for the German people after World War II. 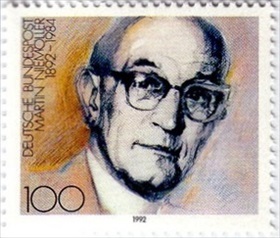 Left: Martin Niemoeller, 1892–1984. After his imprison­ment Nie­moeller often spoke of his deep regret about not having done enough to help the vic­tims of the Nazis. In the 1950s he became a vocal paci­fist and anti-war acti­vist and a com­mitted cam­paigner for nuclear dis­arma­ment. From 1961–1968 he served as Presi­dent of the World Council of Churches. In 1966 he was awarded the Lenin Peace Prize. 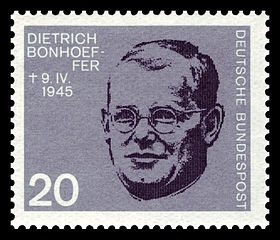 Right: Dietrich Bonhoeffer, 1906–1945. Unlike Niemoeller, who was impri­soned from 1937 to 1945, Bon­hoeffer was free to en­gage in anti-state acti­vi­ties while serving in the Ger­man Ab­wehr (Mili­tary Intelli­gence) under the pro­tection of its chief, Adm. Wil­helm Cana­ris, right up to his impri­son­ment in April 1943. Both Cana­ris and Bon­hoeffer were impli­cated in the July 20, 1944, bomb plot to kill Hitler and both were exe­cuted at Flossen­buerg Prison on April 9, 1945, two weeks before the Allies arrived in the area.